Through funding mechanisms such as the Expanded Food and Nutrition Education Program (EFNEP), UC ANR conducts a variety of education programs aimed at overcoming domestic and global food inequities through culturally-tailored approaches. Improving food supply security: Despite government food assistance programs, 3.8 million low-income adults in California are unable to consistently procure sufficient food to maintain a healthy diet. After learning how to make more healthful and economical food choices, UC CalFresh participants in a four-lesson program called Plan, Shop, Save, and Cook (PSSC) improved their food security by 37 percent and substantially strengthened their food resource management skills. Culturally sensitive nutrition education: Children and adults worldwide are at risk of food insecurity, poor nutrition and obesity. UC ANR Cooperative Extension leads a culturally specific adult nutrition education program that is effective at helping participants achieve improvements in nutrition and food safety. Over the past seven years, the program has enjoyed a graduation rate of 97 percent. 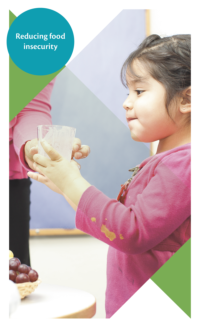 Over the past four years, UC ANR has focused its efforts on families, increasing enrollment in EFNEP by 17 percent, averaging 9,400 participating families with 90 percent improving their nutrition practices, 85 percent improving their skills in managing food budgets, and 43 percent increasing their physical activity.